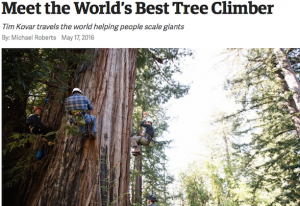 Tree Climbing Planet, a technical and recreational tree climbing school based in Portland, Oregon, leads expeditions around the world for canopy researchers and adventurers. 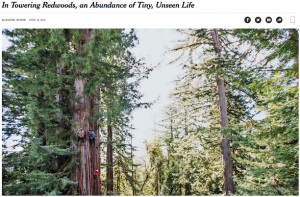 In March 2016, TCP teamed up with a renowned University of California, Berkeley biologist to offer the public a rare opportunity to climb high into the crown of a 200-foot coastal redwood in the Santa Cruz Mountains. Because of the redwood’s delicate ecosystem, climbs are offered only once a year to a limited number of people, and while filling the spots was important, TCP was particularly interested in attracting non-traditional climbers to this experiential learning activity designed to educate people on the biodiversity of the redwoods and connect them to the natural world. Gray Public Relations launched a media relations campaign that included pitches to environmental, scientific, and sports and outdoor writers with top-tier, digital and monthly publications, inviting writers and photographers to join in on the adventure. Several writers, photographers and videographers jumped at the chance to participate in the three-hour guided climb, resulting in articles in The New York Times, Outside Magazine, Earth Island Journal, Takepart, and more. Media coverage was leveraged on TCP’s social media channels resulting in a reach of more than 22,000 and engagement from more than 11,000.